Mahjong Magic Islands is rated 3.9 out of 5 by 8. Rated 5 out of 5 by Buttercups from Fun Mahjong Magic Islands I really liked this game it can be not fun at times but all in all. I really like this game. Rated 5 out of 5 by IsisRising from Good MahJong Its about time that a real game of Mah Jong has arrived. I get so tired of the ones that you match gold tiles. This is fun and relaxing and the graphics are very good. You travel to different islands as you play and collect artifacts that you use later. Although timed it gives you enough to complete the layouts. I will more than likely purchase this game. 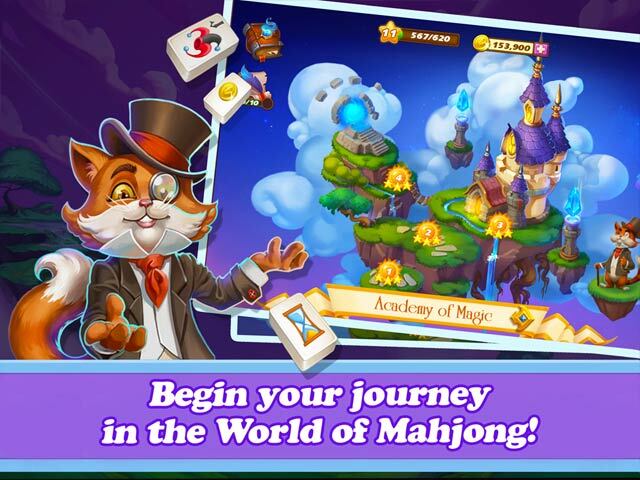 Rated 5 out of 5 by 2020moonlanding from Can Mahjong be magical? Yes it can! This by far is the most enjoyable Mahjong game I've ever played. The cards are tiny but the graphics stamped on them are so crisp and vivid in color that I've had no problems completing each level. If you pause for a moment a hint automatically appears which I greatly appreciate. There are three stars to earn on each of these levels that are reasonable to earn where the timer is fair and doesn't run out quickly. As you complete each level you earn magical elements to form an amulet to move onto the next world. There are charming characters to keep you company with lovely dialogue and helpful hints. The graphics are stunning and each world is unique. The music and sound effects are soothing making this game a relaxing experience. I rarely buy Mahjong games but this one is an instant buy for me. Rated 4 out of 5 by LanaPook from Good for kids This is a pretty standard Mahjong game. I liked that you can change the tile sets. I see that as a big plus. I played about half of the demo. It is a no buy for me because the help function is too quick. I don't like racing with the clock to find a match or it is going to start showing me. I want to do it on my own unless I get really stuck. So... if you like a lot of help this game is for you. 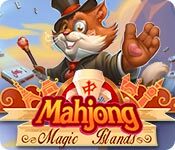 Rated 3 out of 5 by pennmom36 from SPEED MAHJONG If you don't have a "Need For Speed" you're probably not going to enjoy this quest driven Mahjong Game. I give the devs credit, however, for thinking outside the box to create something new out of a dull genre. 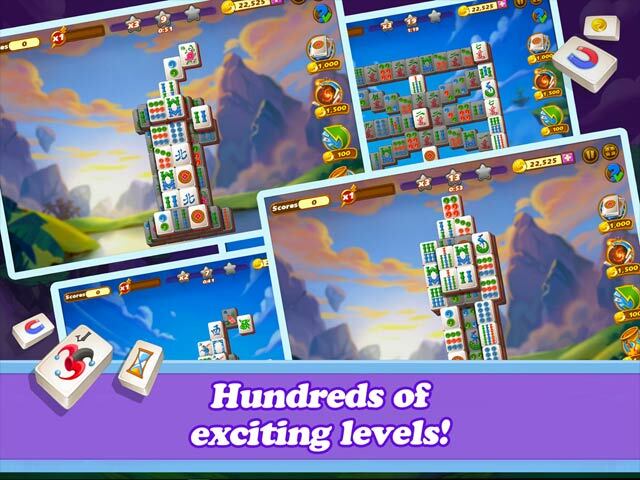 The goal is to make matches of free tiles as quickly as possible and earn all 3 stars to earn items needed to progress. The first star is earned when you earn a specified amount on the multiplier index, the second star is earned by making a specified amount of matches within a specified time, and the third star is earned when you remove all tiles from the field. After each level, you will receive items that allow you to create the Amulet you need in order to progress. Coins are earned as you remove tiles, and also earned as a treasure chest fills which is time-based. Bonuses are added that can be purchased (just click on the bonus to the right to purchase) with the coins earned. The Help bonus will outline matches for a brief period, the Bomb bonus removes a portion of tiles and the Undo bonus will undo the last move. As you progress, Bonus Tiles are added to the field such as a Timer which adds time to the clock when they are matched. 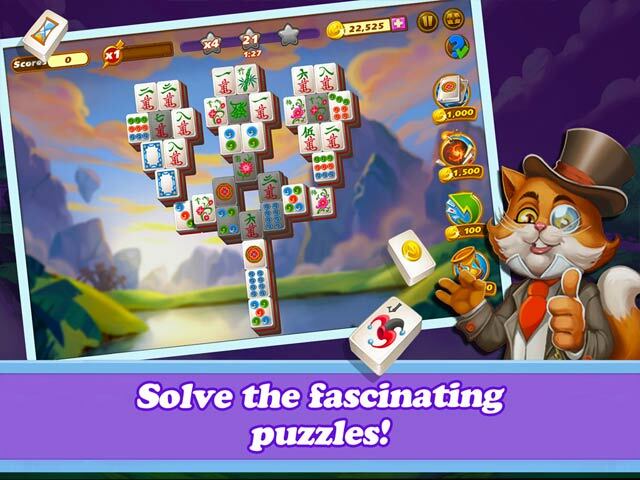 You will also unlock different tile styles, I rather enjoyed the Cats style where all the tiles have different Cats, pawprints, wind-up mice and goldfish. This is just an okay game for me personally. It wasn't bad, but I wouldn't purchase it even with a PCC. It was fun to play the demo, but towards the end, I became bored with doing the same thing over and over. I think this game would appeal to more players if it had a Relaxed, untimed option.